Comma vessels – cite! 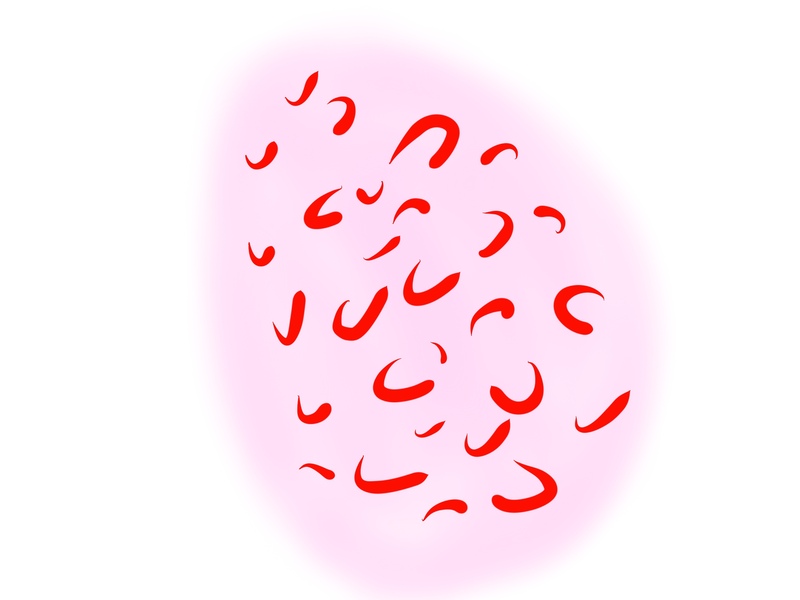 Comma vessels (message) Comma vessels – participate! Comma VesselsThis glossary term has not yet been described. Comma vesselslinear curved short vessels dermal nevi are slightly curved vesselscomma vessels - linear curved short vessels - dermal nevi monomorphous vessels: one type of vessel dominates that appear to take the shape of a comma. These vesselsThis glossary term has not yet been described. 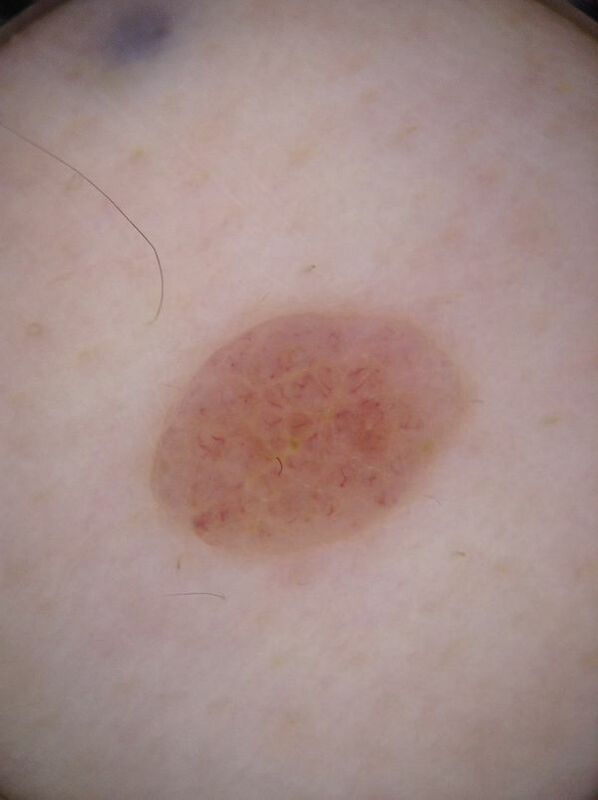 tend to appear slightly out of focus, as their deeper location within the dermis does not allow for sharp visualization under dermoscopyThe examination of [skin lesions] with a 'dermatoscope'. This traditionally consists of a magnifier (typically x10), a non-polarised light source, a transparent plate and a liquid medium between the instrument and the skin, and allows inspection of skin lesions unobstructed by skin surface reflections. Modern dermatoscopes dispense with the use of liquid medium and instead use polarised light to cancel out skin surface reflections..
Comma vessels are most commonly associated with dermal neviThis glossary term has not yet been described.. In a study of dermal/ congenital neviis a type of melanocytic nevus (or mole) found in infants at birth. This type of birthmark occurs in an estimated 1% of infants worldwide; it is located in the area of the head and neck 15% of the time., 66.3% exhibited this vascular pattern, with a PPV of 94% . In another study, comma vesselslinear curved short vessels dermal nevi, when distributed in an organized fashion and when they comprise the predominant observed vessel morphologyThis glossary term has not yet been described., are predictive that the lesion in question is not a melanomaThis glossary term has not yet been described. . In other words, comma vessels are highly suggestive of benignis any condition that is harmless in the long run neviThis glossary term has not yet been described. with dermal nevi being the most common, but they can also be seen in compound nevi. Comma vessels as they appear on an intradermal nevusThis glossary term has not yet been described. ↑ Menzies et al. : Dermoscopic evaluation of amelanotic and hypomelanotic melanomaThis glossary term has not yet been described.. Arch Dermatol 2008;144:1120-7. PMID: 18794455. DOI. This page was last modified on 11 January 2019, at 22:52.